The key in reclamation is figuring the eventual landscape and reuse plan before excavation is begun (Whyte 1970: 355). W H Whyte One area of mineral working in England has recovered so fully that a Broads Authority with the status of a National Park was established in 1989 [Fig 6.2]. For several hundred years the area was thought to contain natural water bodies of estuarine origin. In the 1960s it was proved that: ...the Norfolk Broads, the most used and bestï¾­known of British lakes, are literally the handiwork of our ancestors. On the evidence now available they are, beyond reasonable doubt, the flooded sites of former great peat pits, made in the natural fenland in medieval times. At first they must have been ugly sheets of relatively deep water, bounded by sharp margins of undisturbed deposits: but progressive shallowing of the open water by accumulation of mud within their basins, and overï¾­growth of their margins by encroaching vegetation, have combined to soften their contours and produce the generally more natural appearance of the broads we know today (Ellis 1965: 65). A comparable area of Holland was quarried for peat, from Roman times until the seventeenth century. Today: The Friesland lake area is internationally known as a water recreation area. All sorts of activities can be done: sailing, swimming, sunbathing, motorboating, surfboarding, walking and cycling around the lakes... Especially since the Second World War, tourism has gained an important role in the area (Moolen, 1996). This is a good principle for future mineral workings, but society cannot be expected to wait three centuries for an acceptable after-use. Private landowners have often taken care of mineral workings on their own land, for agricultural and other reasons. In the nineteenth century quarries were opened to win building stone ï¾­ and restored as rock gardens on their owners' estates [Fig 6.3] (Turner 1986:109). Contemporary legislation for the control of mineral working was concerned with the health and safety of the labour force (Roberts & Shaw 1972: 17). In the twentieth century there has been increasingly comprehensive control over the environmental sideï¾­effects of mineral extraction, but in most countries the legislation is still too weak to deal with after-uses. The Cornish china clay mines began before planning controls existed and will continue indefinitely, because they supply some 40% of the European market. In 1970, a team made up of landscape designers, planners and company representatives, was able to agree on reclamation and afterï¾­use plans solely because the company needed permission to dump mining wastes on land which was hitherto unaffected by mineral working (Greengrass 1977: 87). This example emphasises the importance of phasing when planning the landscape of mines and quarries: it is a means of ensuring that land is cared for. Australia was one of the first countries to legislate for the restoration of mineral workings. The New South Wales Coal Mines Regulation Act (1912) required topsoil to be replaced and depressions to be drained (Thomas 1978: 143). In 1939 West Virginia became the first American state to control mineral working, but only seven states required the reclamation of coal workings by 1967 (Cummins 1973). Since the early 1970s mineral workings in North America and Australia have been regulated by laws dealing with particular industries and by general acts concerned with the assessment of environmental impacts. Thus in America surface mining of coal is regulated both by the National Environmental Policy Act (NEPA) of 1970, by numerous state laws, and by the Surface Mining Control and the Reclamation Act of 1977 (Surface Mining 1981). This provides better control over mining than other American land uses. But avoidance of negative impacts is only half the problem. The places from which materials are won offer the most stupendous opportunities for land shaping. Occasionally, it can be done purely for artistic purposes. More often, it should be for functional reasons. New lakes can be dug; new mountains formed; old mountains excavated to make special types of enclosed space; new valleys can be planned, amphitheatres dug. Given the splendour of these possibilities it is puzzling that mineral extraction has for so long been regarded as an undesirable land use which ought to be hidden away behind small mounds and thin belts of sickly trees, necessary though they may be during the operational life of the pit. Multi-purpose planning could reap great benefits for the minerals industry and for society. 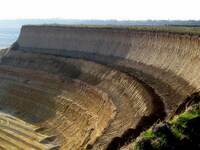 When human life has gone, earthworks may be all that survives from man's short occupation of the planet. Largest among the monuments will be the piles of rubble, once cities, and the great pits from which the materials to build them were won. Pits near cities will be found to have been filled with our goods, arranged in neat layers and protected with clay caps. Since the best examples of electric kettles, plastic containers and light bulbs will be found in these pits, visitors from other planets may conclude that we lived in fear of catastrophe. Surely, they will never guess at our sheer wastefulness. Nor, unless they find a book on the landscape of minerals in the dump, will they guess at what could have been done with those great pits.